The basis weight balance is a digitally controlled scale that is programmed to instantaneously display a reading of basis weight. Depending on the model, the basis weight balance measures lbs per 1000 sq. ft. and/or grams per square meter (GSM). The basis weight balance is used typically for weighing paper. PCE-DMS 200 is a GSM paper basis weight balance or scale used to accurately determine the basis weight (in relation to a square meter of material) of paper, cardboard, fabric, textiles and more directly in g, g/m², oz or oz/yd². The basis weight Basis Weight Balance directly shows the result in g/m² with high resolution (0.1 g/m²) / the weighing unit can be changed to grams by pushing one button only. 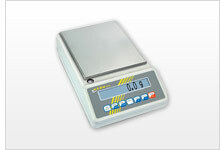 All test instruments, also scales and balances, are delivered manufacturer calibrated. An ISO calibration / certification can be ordered optionally.